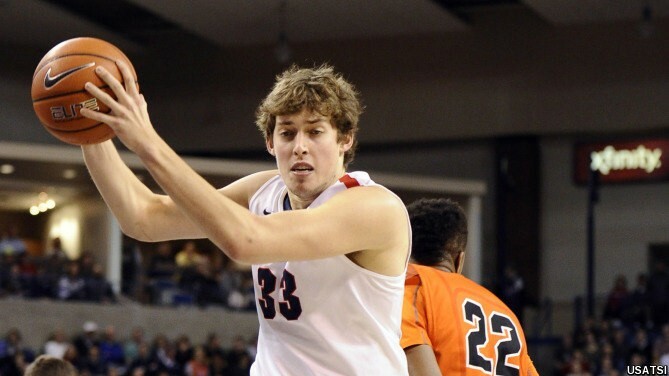 Gonzaga's Kyle Wiltjer leads the team against BYU Monday night. Ladies and gentlemen, start your madness! Actually, in some cases for teams around the Inland Northwest, March Madness has already come to an abrupt end. That's a bummer for Whitworth's men's team, which lost a home game against Whitman to kick off (and abruptly end) its NCAA Division III run, and for Gonzaga's women, who lost to Santa Clara in its opening game of the WCC women's tourney. But let's not dwell on the negative. For most of our regional hoops teams, opportunity is right in front of them. Let's break it down. Even the most casual of basketball fans knows that Gonzaga hasn't had quite the dominant year that they (or HBO) imagined they would have when the season began. They lost to nearly every marquee name on their schedule, lost their starting center to injury and find themselves having to win the WCC tournament in Las Vegas this week to assure themselves a spot in March Madness. The started strong, pummeling Portland on Saturday behind strong games from the usual suspects: Kyle Wiltjer, Eric McClellan, a resilient Silas Melson and an increasingly ridiculous Domantas Sabonis, who is suddenly capable of drilling three-pointers at will, at least against the Pilots. After taking Sunday off, the Zags take on BYU tonight in the WCC semi-final. The game is at 8:30 pm on ESPN2. A victory would put Gonzaga in the WCC championship game Tuesday against the winner between St. Mary's and Pepperdine. That game will be at 6 pm on ESPN. On the men's side of the Big Sky, both the Vandals and Eagles have legit shots at making a run at the tournament title and landing in March Madness. Idaho has the easier path, thanks to a strong finish to the season that earned the team the No. 3 seed in the Big Sky tournament. Wins against conference champs Weber State and in-state rival Idaho State puts the Vandals in strong position to make a run. The chemistry Coach Don Verlin talked about in our basketball preview issue is clearly working for the Moscow crew. Idaho will play Thursday against the winner of the Eastern Washington/Northern Arizona game that's happening Tuesday in Reno. The Eagles should handle the Lumberjacks, but you never know in the crazy Big Sky. The Eagles are the defending conference champs, but lost their last four games, including two tight ones at home against Idaho State and Weber State. On the women's side, both Idaho and EWU have byes in the first round of the Big Sky tourney and will play on Wednesday; Idaho will play the winner of the Weber State/Portland State play-in, and Eastern will play the winner of the Sacramento State/Southern Utah game. Cougs fans get one more chance to watch WSU and hope for an upset as Ernie Kent's squad takes on Colorado Wednesday at 2:40 pm. Talk about a great excuse to take an afternoon off! If the Cougars can pull off the upset, they'll take on Arizona Thursday. The women's squad saw their season end with a loss last week to USC.